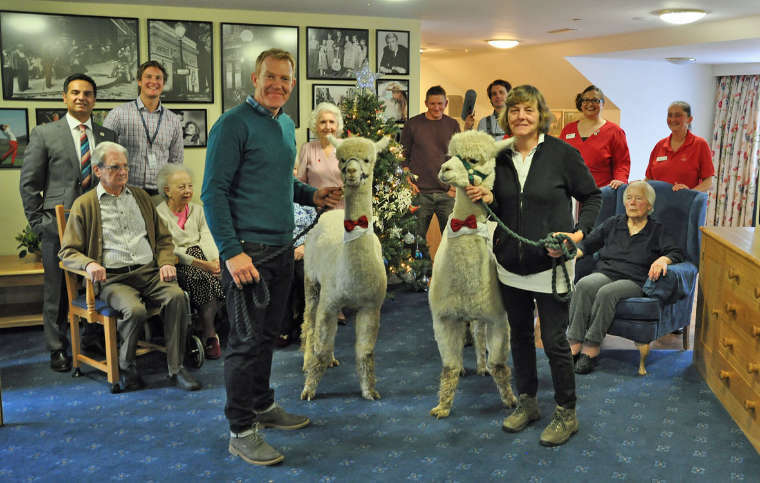 Residents and visitors at Newstone House did a triple take when they were visited by BBC Countryfile star Adam Henson and two alpacas. Adam and alpacas Oliver and Jimmy were filming at the Colten Care home in Sturminster Newton for an upcoming episode of Countryfile. Adam met residents in the home’s lounges and indoor beach and even took his furry friends in the lift, to visit some people in their rooms. He said, “Of all the strange things I’ve done, I’ve never been in a lift with alpacas! The presenter, his cameraman and sound engineer were invited to the home by Wendy Williams, the owner of Alpaca Adventure in Shaftesbury and a regular visitor to Newstone House. Wendy, who owns Jimmy, Oliver and 34 more alpacas, explained: “I wrote to Countryfile to tell them about my alpaca walking breaks and was thrilled when they said they wanted to visit us. “They were also very interested to hear how I take my animals to visit Colten Care’s care homes. Sohail Daniel, the manager of Newstone House, was also interviewed by Adam Henson. He said: “Our residents and all the staff love Countryfile and it has been wonderful to show Adam and his crew around. “After seeing the response of our residents to the alpacas Adam said he is considering introducing them to his own visitor farm in the Cotswolds, which is fabulous. The programme will be broadcast on BBC One, on Sunday December 10 at 6.20pm.